CLP Current Events take classrooms across the globe to the coastal region known as Rakhine in southwestern Myanmar. There the Rohingya, a minority Muslim people in majority Buddhist Myanmar, are fleeing for their lives to adjacent Bangladesh, India and other countries in East Asia. CLP suggests beginning with Background and More where excellent articles about the Rohingya, their history, and current suffering are explained. How do you pronounce Rohingya? How do you pronounce Aung San Suu Kyi? CLP: learn what’s happening in refugee camps in Bangladesh now. CLP: India weighs in; a regional issue goes global. CLP: why Myanmar’s Noble Prize winning leader does not attend important UN meeting. Where is Rakhine? Myanmar (formerly Burma)? Bangladesh? India? Who is Aung San Suu Kyi? What might explain her reluctance to comment about the threat to the Rohingya people in Myanmar? What pressure has forced her to explain the Rohingya refugee crisis? 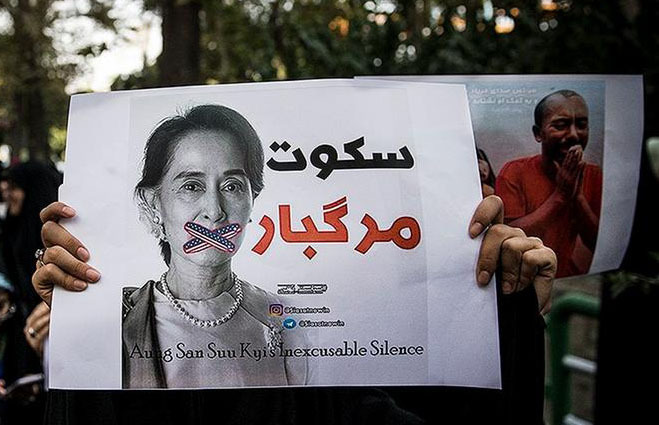 Why is she under special obligation to care about ethnic minorities in Burma? Why are the Rohingya fleeing Myanmar? What is the effect of the out migration of the Rohingya on the neighboring countries? What are the prospects for solving this refugee crisis? What is the connection between majority and minority rights in a constitutional government? How do international organizations guarantee minority rights? Why is it important to protect minority rights from the rule of the majority? Do decisions about protection for the Rohingya affect the treatment of other minorities? What might be some solutions to this crisis? What is the status of refugees in the United States? How should the United States and the rest of the world respond to the treatment of the Rohingya in Myanmar? https://learning.blogs.nytimes.com/2014/11/07/6-qs-about-the-news-as-myanmar-advances-resettlement-plan-rohingya-flee/? WHAT policy has the Myanmar government adopted toward the Rohingya? WHY is the crisis an embarrassment to the White House? WHAT kind of discrimination have the Rohingya faced in Myanmar? HOW many Rohingya have fled since an outbreak of sectarian rioting in 2012? WHEN did many Rohingya go to Myanmar? WHAT are some of the official policies laid out in the Rakhine Action Plan? WHAT is life like in Rohingya camps and villages? WHAT are the risks that many Rohingya face when they flee Myanmar by boat? HOW should the United States and the rest of the world respond to the treatment of the Rohingya in Myanmar? What did the United Nations call the humanitarian situation? Which border did the Rohingya cross? How many Rohingya have fled? What did the BBC say had burned down? How long have the Rohingya lived in Myanmar? What did the article say Aung San Suu Kyi was under? When did Aung San Suu Kyi win the Nobel Peace Prize? 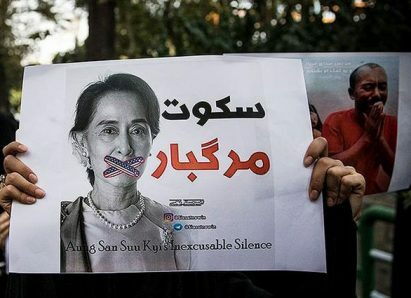 What has Aung San Suu Kyi not condemned? Who asked Myanmar to take the refugees back? Who did the Myanmar army say were the indigenous people of Myanmar? CLP: everything in a nutshell; this is very good! 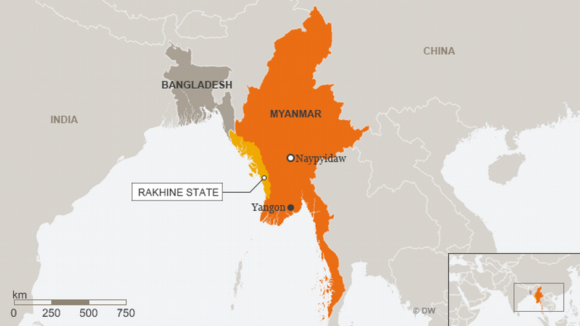 Myanmar: Who are the Rohingya? CLP: comprehensive and up to date; a must read. CLP: why this is an international concern. CLP: Important, basic “Questions to Consider” (listed in Section above and) found here. CLP: Teaching English skills using Rohingya content. CLP: putting refugees in context of an historical event. Potentially powerful lesson. Do Rohingya Refugees in India have Constitutional Rights? CLP suggests: use this primary source document in your own lessons! CLP notes: short, concise, useful resource. CLP: fascinating primary source document that frames issues in useful questions for the classroom. CLP notes: helpful background content. HS.3 Explain the historical development and impact of major world religions and philosophies. HS.16 Analyze the interconnectedness of physical and human regional systems (e.g., a river valley and culture, water rights/use in regions, choice/impact of settlement locations) and their interconnectedness to global communities. HS.19 Evaluate how differing points of view, self-interest, and global distribution of natural resources play a role in conflict over territory. Unit 6, Lesson 36: How have American political ideas and the American Constitutional System influenced other nations?